My son Matthew had three different celebrations for his fourth birthday! Lucky boy! First, we went out for jamba juice (his favorite) and a pizza dinner the evening of his actual birthday. Then that weekend, we had a big party for him with Superman cake and Superman cookie favors. And in between those two celebrations, we also had a party at his preschool with all of his classmates! 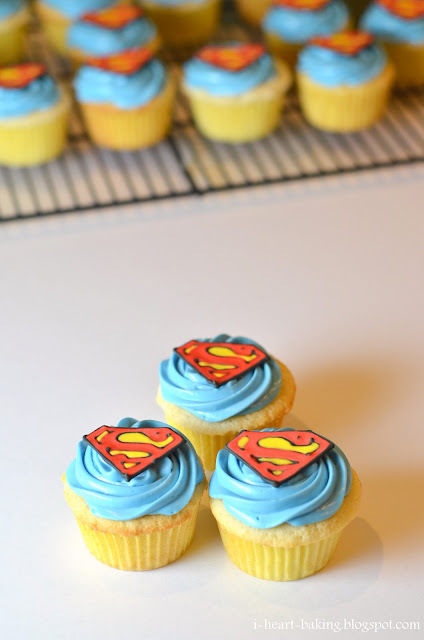 For his class party, I made vanilla cupcakes (using the same recipe as his Superman cake), and topped it with a swirl blue cream cheese frosting. I also initially wanted to fill the cupcakes with strawberry whipped cream, but I ran out of time and dropped that idea when it was about 1am and I wasn't done making the cupcakes yet! 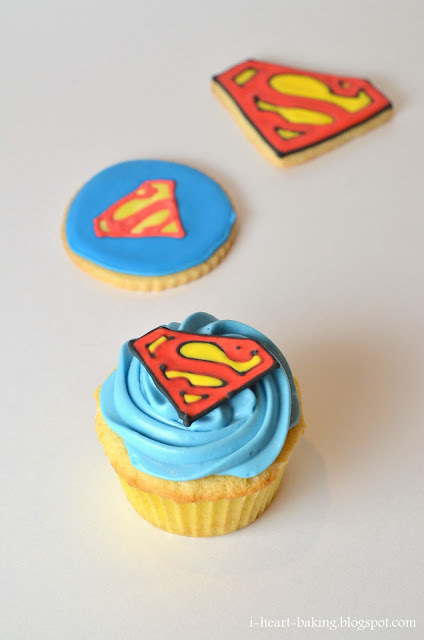 The final touch was a Superman logo that I had piped with royal icing ahead of time. It was exactly like piping royal icing on a cookie, except that I piped it on waxed paper instead! And then I just peeled them off (carefully) and placed them on top of the cupcakes. 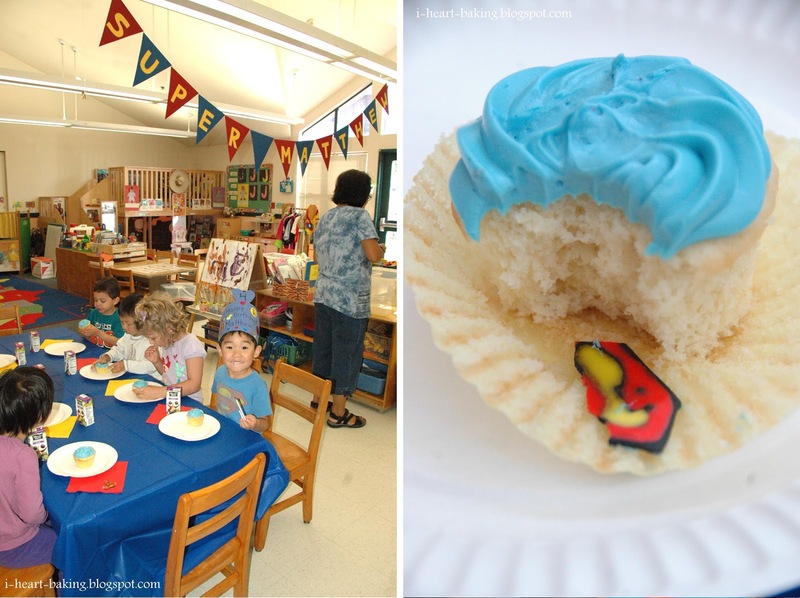 While I watched the kids eat their cupcakes, I realized that they all had almost the same strategy - first, carefully remove the Superman logo and devour it. Then lick all of the frosting off of the cupcake. Finally, eat the cupcake (although most of them just licked off all the frosting and the went off to play!) But I was proud of my Matthew, he ate his entire cupcake! (Which meant that he liked it, since he normally doesn't like cake). Hope you had a wonderful birthday, Matthew! Very cute cupcakes! I love the royal icing logo, great idea! how do you make the royal icing decoration that you added to the cupcake?!?! @Sammy - i taped a piece of wax paper to a piece of cardboard, and then piped the logos with the same royal icing that make for my cookies. i start by piping the logo and S outline, then when that dries i fill in the red and the yellow icing. once it's dry (usually 24+ hours), i peeled them off the waxed paper carefully (i broke a few, but it was ok because i made extra). Did you just free hand the Superman logo or did you use some type of template? They all look exactly the same. Very cute cupcakes and cookies!! What is the recipe for your royal icing? If you send me your email address I can email it to you if you like. Great idea with the royal icing logo. Thanks for sharing. Did you use a template for the superman? Like under the wax paper? @i rock your world - yep! i put the waxed paper over a picture of the superman logo, and use that as a template while piping. Brilliant Logo! 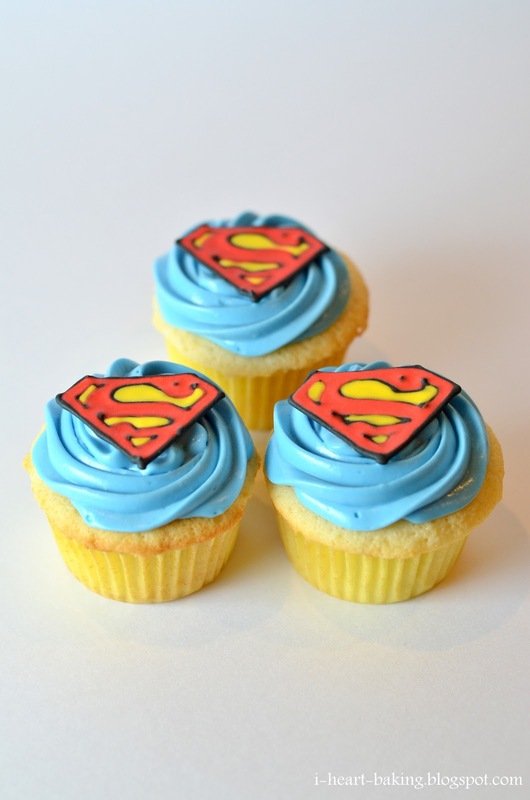 I have just made some superman cupcakes for a friend using your technique for the logo. Worked brilliantly, thank you so much for sharing your method. I was struggling to get hold of wax paper in the time frame I had, so I used some of those A4 punched pockets, the shiny surface worked a dream and they came off really easily. All your cakes are stunning, very talented! Thanks again.